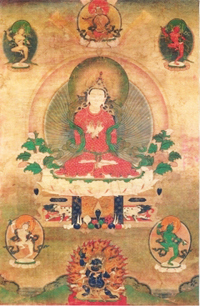 The Taklung Kagyu lineage is a part of the general Kagyu lineage that begins with Marpa the Translator (1012-1099) and was passed directly to his main disciple, Milarepa (1040-1123), the most revered of all of Tibet's yogins. 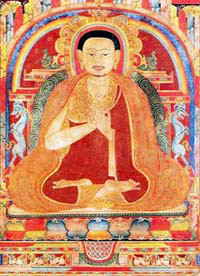 From Milarepa it was passed to Gampopa (1079-1153) who combined the Mahayana teachings of the Kadam tradition with the yogic disciplines of the Kagyu masters, in particular the teachings on Mahamudra. Gampopa also established the first monastic order of the Kagyu lineage that has since been the mainstay of the Kagyu sangha ever since, although the lay yogic tradition exemplified by Milarepa has also continued to the present. From Gampopa the Kagyu lineage branched into four sub-lineages that were founded by four of Gampopa's closest disciples. 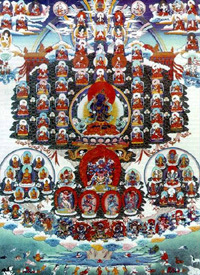 One of these disciples was Phagmo Trupa (1110-1170), who in turn became the source of a further branching of the Kagyu lineage into an additional eight lineages, all of which were similarly established by Phagmo Trupa's most important disciples. The Taklung Kagyu lineage remains unbroken to this day, since it's founding by the Great Lord Taklung Thangpa Tashi Pal (1142-1210), who also founded the Taklung Yarthang Monastery. He was the unequalled Lord of Dharma, and was the protector of sentient beings of the entire three world systems, and the embodiment of the enlightened body, speech, mind, quality, and activity of all the Buddhas of the three times and ten directions. Having achieved perfection in devotion and respect towards his root teacher and his teachings, Tashi Pal is considered as one of the many immediate students of the great Lord of Dharma, Pal Phagmo Drubpa, the protector of beings. Sangye Won was a descendent of the Taklung Gazi Family, the same auspicious family lineage in which many great noble masters including Taklung Thangpa Tashi Pal, the guide of all beings of the three worlds, were born. He was born in 1251, and displayed many wonderful and extraordinary signs during his birth and childhood. Even while playing, he showed many inconceivable miracles. In the Wood Tiger Year of 1254, he travelled to Central Tibet, where he met many teachers from whom he received empowerments, transmissions and instructions. Particularly, he was taken care of by his root teacher Choeje Sangye Yarjon who conferred upon him the authority to hold the secret treasures of teachings. Sangye Yarjon appointed him as his spiritual heir after bestowing him his entire teachings.